Yugawara Ume Park (湯河原梅林, Yugawara bairin) is one of the biggest "Ume," Japanese plum, park in Kanto. It is located at the southern part of Mt. Hakone. 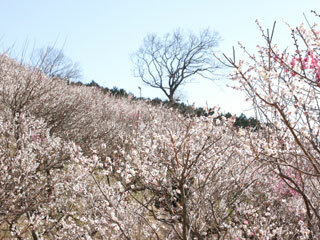 The park has over 4,000 Ume trees. During the end of February to beginning of March, there are festival and beautiful light-up for Ume trees. Because the park is located on the mountain, you can enjoy all ume trees at once from either lower angle of upper angle. At the festival, there is Japanese drum performance by local high school. There are public parking (500 yen), but during the season, it would take a couple of hours to park. So, we recommend here by train. 2. use local bus to Yugawara bairin (15 min. ), there is shuttle bus during the season. Yugawarar Bairin is the most beautiful Ume forest in Kanagawa prefecture. It is located right next to Atami which is kind of far from Tokyo. However, it is worth to check it out. Yugawara is also well known for "Onsen," hot spring, spot in Kanagawa. So, if you want to enjoy Ume blossoms and Onsen at the same time, Yugawara is one of the best choice. The park opens for Ume Hanami at February 11 to March 15th, and light-up starts from the end of February. The festival also starts around the same time. In the festival, you can enjoy Japanese drum performance, and great local food, especially Japanese Orange and flesh fish. Ume soft-cream is also their famous sweets in this Festival. This park opened in 1995. Since then, they plant more and more Ume trees. So, it gets better and better every year. This park is also great for hiking. If you love one day hiki, visit Yugawara Birin, and enjoy excellent hiking with Japanese plums.